What do families from as nearby as Long Island, NY and Central New Jersey and as far away as Ireland and Norway know about that perhaps others haven’t learned yet? Malibu Dude Ranch is an authentic dude ranch on the east coast, and is the oldest operating dude ranch east of the Mississippi. 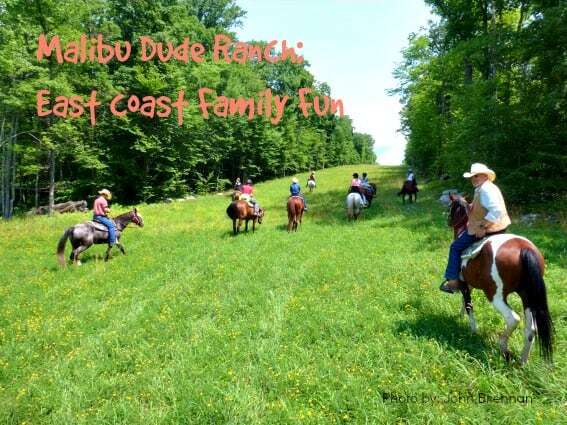 Located in the picturesque Pocono Mountains of Pennsylvania, the 800-acre Malibu Dude Ranch prides itself on two things: creating family memories and horseback riding. There is no need to catch a plane out west to experience the thrill of riding through nature on the back of a horse. In fact, those on the west coast might want to think about heading east. ‘Doc’ Alan Detweiler bought the ranch in 2010 after learning his beloved ranch was being turned into a housing development. He first visited the ranch as a rambunctious kindergartener in need of an outlet. Subsequent visits set him on the straight and narrow and today he gets to share the same beloved ranch with guests as well as his own family of teenage girls. The Malibu Ranch is home to over 60 well-cared-for horses. They are saddled-up each day and prepared for a day of trail riding. Riders aged eight and over are encouraged to ride as much as possible. The trails are open each day to guests for unlimited riding. My eldest daughter is a newly minted horse lover so she wanted to ride as much as possible. During our week-long stay, we rode sometimes as many as four times a day. Chris, the barn manager is responsible for matching horse with rider. It is safe to say that he has a keen eye for over-inflated horse rider egos and weary newbies. He gingerly assesses each newcomer with conversation about experience, ability, and fear. The first ride of the day is a walking trail ride. That would have been enough for me. The beauty of the area is amazing. I felt as if I was going back to a simpler time with just my horse and me. 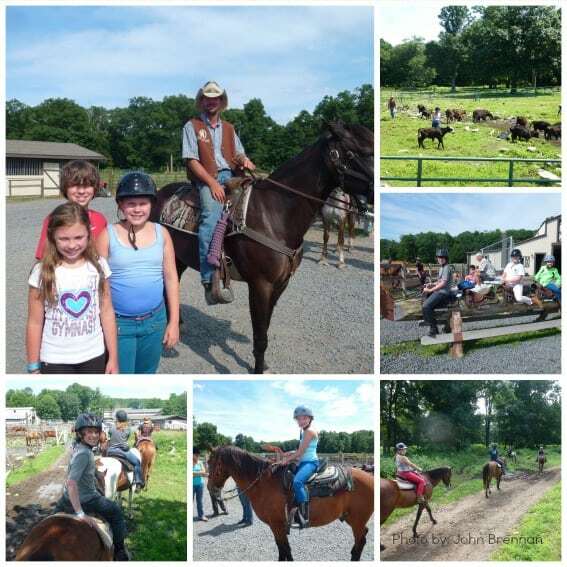 Wranglers deftly teach the basics of single reign riding and evaluate riders as they meander not in a line, but scattered throughout the Pocono wilderness. Every trail ride we had ever been on prior to this was a single file only type of affair. To be fair, there are times when this must be done at Malibu, but in the vast forest we were encouraged to take our horses apart and learn how to steer them. By the end of the second day my group was eager for more than walking rides. Chris matched us with a wrangler and some other ready riders and we were off for a trotting ride. We learned to seat the trot, not to bounce, and what to do to get our horses to want to trot. By the third day we were a bunch of aspiring canterers. Our wrangler made sure we knew what to do and before we could say ‘giddy up’ our horses were fluidly cantering through a field. Daughter number two was now completely smitten by the horse bug. They were clamoring constantly for more cantering. Chris did the best he could to take care of their wishes each day. Beyond riding, horse lovers can help out in the barn feeding the horses or removing tack each day. The ranch also provides scout groups the ability to earn equine badges through horsemanship and riding classes. We witnessed a scout troop doing just that the week we were there this summer. Experienced riders over the age of 13 can participate in weekly cattle drives required to move the herd around. However, nothing made my eldest daughter happier than when Chris asked her to help him round-up some calves. She felt like part of the wrangling group she had come to know. Each one of them was patient and kind with all of the riders. She is ready to go back someday for the full summer wrangling experience and some cattle driving! The staff at Malibu ranch wants to make sure guests create memories for a lifetime or at least until their next visit. In addition to a week’s worth of terrific horse riding, my family was introduced to archery and target shooting. Provided with bow and arrows, they set off for the daily mission to make a bull’s eye. Although there is no instruction provided, they did get better each day and were able to eventually meet their goal. Target shooting provided an opportunity for some father/son rivalry as they chased the elusive bull’s eye at those targets as well. Safety is the number one concern so there is always a staffer on hand. More memories were created at the hayrides and bonfires that are held on select evenings. All of the guests jumped into a hay covered wagon. We spontaneously broke into a few rounds of ‘100 Bottles of Beer’ and ‘She’ll Be Coming Round the Mountain’ as we rambled through the ranch property. The hayride ended with some socializing around a torrid bonfire where marshmallows were just waiting to be roasted. Of course there were also unscheduled activities waiting in between horse rides. Pick-up basketball games and tennis matches without the call of electronic devices and television beckoning created fun family times. 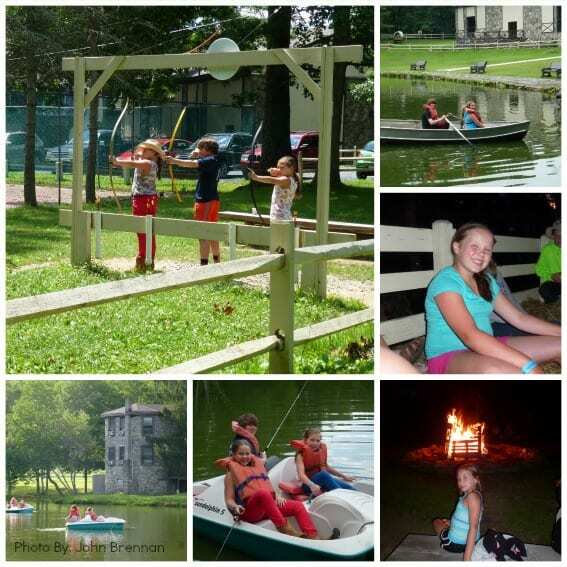 Our kids felt the freedom of being kids while they untangled fishing lines, rowed a boat, made friends at the basketball court, or swam in the pool. Other than the swimming, we felt comfortable allowing them the roam about the property without knowing where they were at all times. Aside from riding, one of our favorite pastimes was chatting with our table mates around meal times. We made some terrific friends, some with children and some without. They were all genial people and took an interest in the stories our own kids would tell about their riding experience of the day. My youngest daughter continues to recount how nice all of the people she met at the table were to her. Malibu sure does attract some terrific guests. 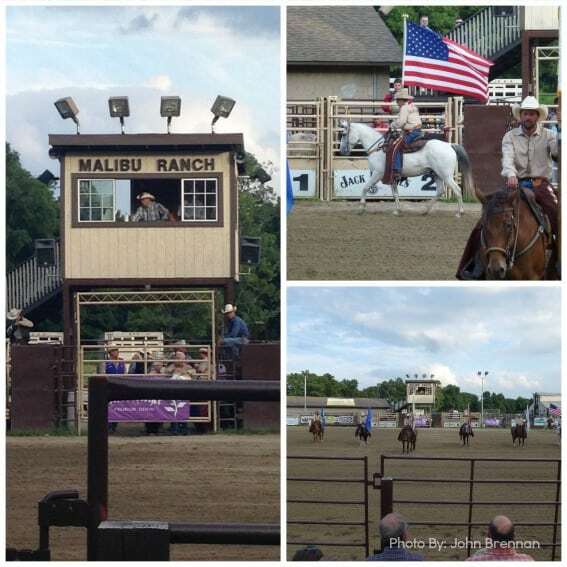 On Saturdays during the summer, the Malibu Ranch hosts an authentic rodeo that cowboys and cowgirls from across the east coast clamor to attend. Only two of us had been to a rodeo before so most of the family was without expectation. We enjoyed all of the segments, but particularly the bull riding and barrel racing. We cheered each girl and horse team on as they rushed around the barrels knowing from our experience how difficult this really was even though they made it seem so effortless. We were especially surprised when Dr. Detwiler’s own daughters made great showings with their horses around the track. However the highlight of the evening for us was watching the opening ceremonies. The wranglers we had come to know and love from the barn carried the flags of the armed forces into the arena followed by the American Flag while ‘I’m Proud to be an American’ played in the background. We then rose for the national anthem. Knowing that one of our favorite wranglers carried the flag of the Air Force in honor of her dad who fought in the Gulf War brought a lump in my throat and a tear to my eye. I took the time to explain to my kids that whatever our differences, people are still more alike than different as I remembered my own grandfather, an Air Force tail gunner over Europe in World War II. Doc Detweiler and the Malibu Ranch staff had succeeded in creating a family memory for us. 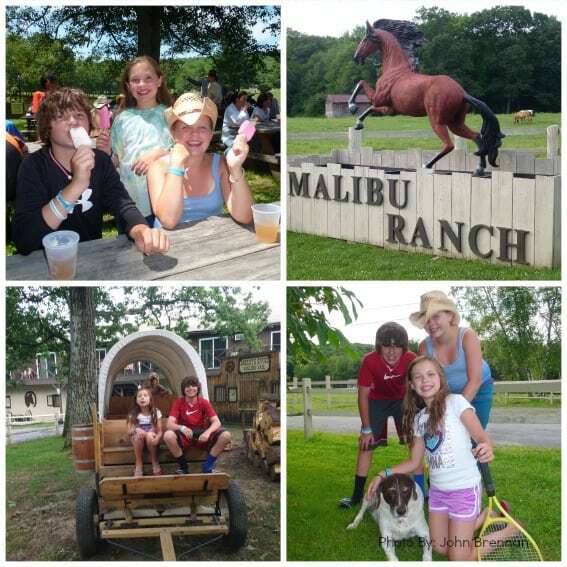 Read my full review of Malibu Dude Ranch. Disclosure: My family and I were provided a complimentary stay at the Malibu Dude Ranch. I was not required to provide any specific opinion and all opinions are my own.